The New York Times headline read, “Russia’s Chinese Worry,” and the story discussed the conflict on the Russian-Chinese border in eastern Siberia. Russia, it explained, is having trouble both maintaining political control over its northeast Asian provinces, and limiting the influence of its much more populous southern neighbor. “The excess of the Chinese population, if allowed to get out,” it said, “would in a comparatively short time overrun all of Asia.” As for Siberia, “The Russian authorities are completely outwitted by this invasion which has been going on for the past fifty years, and which has now given China a firm foothold all along their southern border. This story was published in 1892. However, with just a few changes in style, it would comfortably fit in with a spate of recent reports on the subject. For instance, a 2006 Newsweek story, “Fear and Loathing in Siberia,” reported: “Nowhere is China's growing dominance more evident than in Siberia, a vast land far larger than China itself but inhabited by a mere 30 million Russians.” Joshua Kucera’s five-part series titled “Where Russia Meets China,” published in 2009 by Slate and Foreign Policy Review, covered similar ground. Close to a billion Chinese were pressing against a frontier that their government officially did not recognize—in Chinese high school textbooks large areas of Siberia are shown as Chinese—confronting a mere thirty million Russians in a barren Siberia so forbidding to the Soviet nationalities that throughout history it has had to be forcibly colonized by convict labor. Siberia has a population vacuum sitting on a vast and barely exploited field of natural resources: coal, metals, diamonds, oil and gas, and the world’s largest forests—all of which the Chinese manufacturing behemoth requires and desires. In early 2010, the Russian government announced that it had discovered a new oil field in Eastern Siberia, with reserves of 1.17 billion barrels. The Russian conquest of Siberia was roughly contemporaneous with the Western invasion of the Americas. In the mid-1500s, Russian Cossacks crossed the Urals and began subjugating the neighboring khanate, and then the various tribes. By the mid-17th century, they had reached the Pacific and the Chinese empire. In 1689, the Treaty of Nerchinsk left the Chinese in control of the Far East. But by 1869, with the Treaty of Aigun, Russia had regained the area and driven the Chinese out of what is now Vladivostok. In other words, the line is newer than the U.S.-Mexican border and far more variable. But is it really up for grabs? 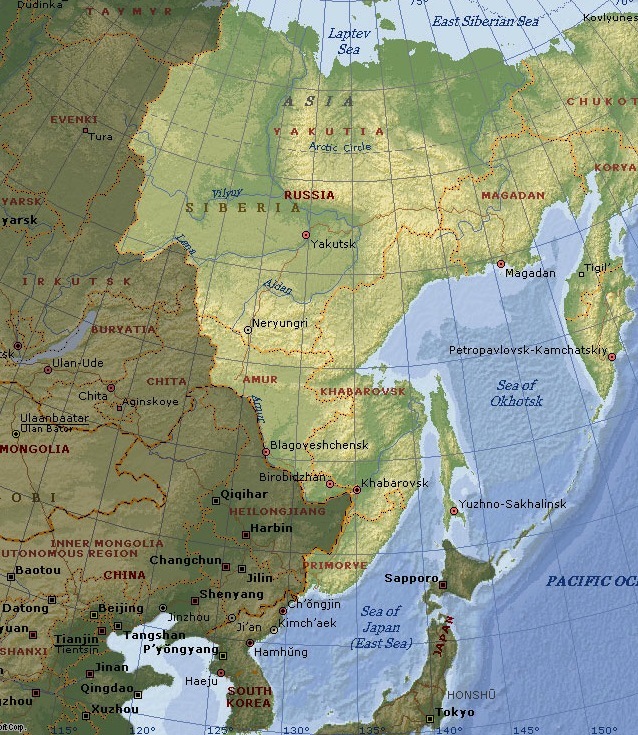 Chinese acquisition of Siberia would be a major world political shift, and would further advance the Chinese drive to re-establish itself as the world’s preeminent nation. So, why aren’t we talking about this more? After all, we devote millions of media hours to predicting the tedious fortunes of the resource-poor and relatively unpopulated Holy Land? But the few mainstream articles that discuss the Chinese in Siberia generally talk about cross-border immigration, not military moves. As it turns out, the coming Chinese invasion of Siberia is a hot topic—in Russia, not surprisingly, but also in the nether regions of the U.S. right-wing blogosphere. In fact, Siberia speculation is positively relished by intel-minded bloggers, as well as by some think tank types and white supremacists. Is it possible these people know something the rest of us don’t, or is something else going on? An early mention of the Chinese invasion theory came in Tom Clancy’s 2000 novel, The Bear and The Dragon. Previously, Clancy had theorized about a Japanese re-establishment of the “Greater East Asia Co-Prosperity Sphere,” but the collapse of the Japanese bubble led him to change his focus. In The Bear and The Dragon the Chinese invade Siberia, but are, of course, ultimately stymied by U.S. President Jack Ryan. Not surprisingly, an undercurrent of racism underlies most of these stories. Western observers can barely contemplate China without the words “hordes” and “overrun” hovering above the page—although in modern times it’s the West, Russia, and Japan that have done the overrunning. The truth is that while China has sent out millions of emigrants, its armies have largely remained in the Middle Kingdom, where since the revolution, they’ve spent most of their energies suppressing domestic uprisings. China’s only recent cross-border military adventures were into Korea in 1950 and Vietnam in 1979—neither of which resulted in anything resembling victory. In fact, the mainstream news can’t seem to get enough speculation on China’s possible military goals. Obviously, China is improving its military. But could it invade, and hold, Siberia and the Far East? In truth, it’s not that easy to invade Russia. Just ask the Japanese, who were the last Asian military power to try. In the spring of 1939, the Japanese used a pretext to invade Soviet ally Mongolia, and over the next two months committed more than 30,000 troops in what has been called the battles of Khalkhyn Gol. The upshot was a decisive Soviet victory and treaty, which meant that when Hitler invaded in September, Russia would not have to fight a two-front war. And that was pre-nuclear Russia. Is China becoming an aggressive international superpower aiming to invade Siberia? Depends who you ask. In its 2005 report, “China’s Great Leap Forward,” the neoconservative Hudson Institute spent a considerable number of pages describing China’s emerging “military juggernaut,” and considering China’s own Monroe Doctrine and its threat to Russia. Less warlike observers note that any talk of a mass military invasion of simply ignores the fact that Russia remains the world’s number two nuclear power, with more than 10,000 warheads and twitchy delivery systems. Tom Clancy could write a battlefield novel of clashing armies by ignoring the nuclear issue for the first part of the book. Moscow is unlikely to do that. Of course most American right-wingers avoid such uncontaminated racism, which is one reason why they’re attracted to the seeming plausibility of uncontrolled Chinese growth and military fantasies. But the strange sympathy that the right has for Russia in any conflict over Siberia has its roots in racial solidarity, not in geopolitics. One can see why this angry and beleaguered outlook would appeal to Americans who fear something similar from their southern border. In both situations—China/Russia and Mexico/U.S.—there are militarized borders, irredentist claims, scapegoating of the poorest workers, and an invocation of racial Armageddon. But in spite of that, both borders see trade, humdrum traffic, cultural exchange, friendships and intermarriage. National lines may change—Vladivostok was once Chinese—but there is nothing immediate to indicate that either Russia or China want all-out war. And there is nothing to indicate that Beijing sees a suicidal invasion as preferable to simply buying Siberian resources, and letting the Russians live with isolation, the cold, and the summer mosquitoes. But then again, conspiratorial minds will always discount the likely explanation in favor of an apocalyptic one. Alec Dubro is a writer based in Washington, D.C., and a contributor to Right Web. “Russia’s Chinese Worry,” The New York Times, February 5, 1892. Owen Matthews and Anna Nemtsova, “Fear and Loathing in Siberia,” Newsweek, March 26, 2006, http://www.newsweek.com/2006/03/26/fear-and-loathing-in-siberia.html. Joshua Kucera, “Where Russia Meets China,” A five-part series co-published on Foreign Policy and Slate, December 29, 2009. Henry Kissinger, Years of Upheaval, London, Weidenfeld and Nicholson and Michael Joseph, 1982, p.48. Grigory Ioffe and Zhanna Zayonchkovskaya, “Immigration To Russia: Why It Is Inevitable, And How Large It May Have To Be To Provide The Workforce Russia Needs,” The National Council for Eurasian and East European Research, University of Washington, January 21, 2010. Tom Clancy, The Bear and the Dragon, G.P. Putnam, New York, 2000. Lev Navrozov, “China’s Chance to Rule the World,” Newsmax.com, September 1, 2006, http://archive.newsmax.com/archives/articles/2006/8/31/170933.shtml. Frederick W. Stakelbeck, Jr., “China's Manifest Destiny,” American Thinker, June 1, 2005, http://www.americanthinker.com/2005/06/chinas_manifest_destiny.html. Dr. Jack Wheeler, “Chinese Siberia,” The Vanguard.org, November 2, 2006, http://www.thevanguard.org/thevanguard/other_writers/wheeler_jack/061102.shtml. Enigma,“The problem of the Chinese emigration is becoming more serious for Russia,” Stormfront, August 2006. “China’s New Great Leap Forward: High Technology and Military Power in the Next Half-Century,” Hudson Institute, 2005, http://www.hudson.org/files/pdf_upload/ChinaPDF.pdf. “Russian Military Prepares for Vostok 2010,” Eurasia Daily Monitor, June 2, 2010. Mark Smith, Quoted in “The Russian Far East: A Chinese Future?,” The Defence Academy Journal, December 2007. David Duke, “Is Russia the Key to White Survival?,” davidduke.com, October 23, 2004, http://www.davidduke.com/general/is-russia-the-key-to-white-survival_18.html.